I vacillate daily between wanting to whine about how hot it is, to wanting to punch the people who whine about how hot it is. Oh, look, a highly appropriate ecard. I don't remember summers being this hot when I was younger. I mean, I also don't remember why on earth I would ever eat bologna and mayo sandwiches when I was younger, but still. It may be global warming, or it may be the extra __ pounds I've put on in the last 6 years (have I mentioned our 6th anniversary is next week? There is no mystery there. Happy = Chubby), but either way, I'm burning up. So much so that I am thisclose to eschewing all modesty and/or propriety and am about to start running around in tube tops and hotpants. Like a deranged Hollywood starlet, minus the cocaine and Uggs. Last week, however, we hit 90something degrees in central Arkansas, which might as well have been 237°. I pulled out my favorite light-weight tunic dress and decided to forego the bottom layer. Which is when I realized: I don't own a single strapless bra. I do have two new heavy-duty numbers that I just love. (Lift! Separation!) I also have several ratty comfortable nursing bras that I can't part with, because I am just that nuts. But no strapless ones. Yes. 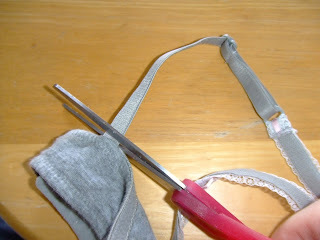 I cut off the straps off one of my bras. Not one of the new ones, one of the ratty previously more useful nursing bras. And you know what? It felt good to have the cool car A/C blowing on my bare shoulders again. I was hyper-aware of my heavy artillery (My arms, not my bazoombas) on display for all of Chick-Fil-A to see, but for just a little while, I didn't care. Now, I doubt I'll be running around in tube tops and hot pants any time soon. Or strappy sundresses. And yes, maybe I need to actually purchase a proper strapless bra instead of my mutilated home-made version. But at least I'm one step closer to self-confidence away from passing out on a fainting couch/punching someone in the face. I'm not sure which I hate more... summer or my arms. 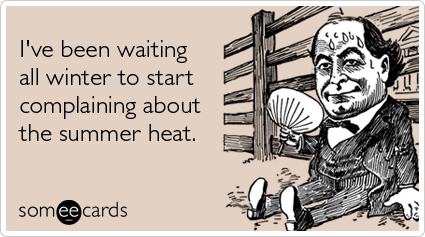 So, until I figure it out, I am refusing to leave the air conditioning. I am so amazed at your creativity and quirkiness. No wait,; that is so YOU! I hear ya on the baring arms thing. It's a fine line for me in the summer, because I wrestle with the cleavage insecurity AND the arm insecurity. But I've worn a strapless dress! To work! WHAT. Yep, THAT HOT. Also I ate bologna and mayo sandwiches as a kid, too.